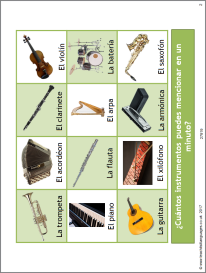 Two photo cards on the topic of music and free time activities, which could be used to help Key Stage 3 students develop their speaking skills with a partner, as teacher assessment or as revision for GCSE classes. The PowerPoint introduces the topic vocab and rehearses the questions and answers. Teaching notes with suggested additional questions are included. Thank you, thank you, thank you for translating this into Spanish.